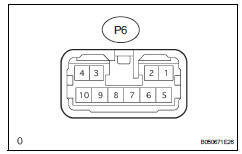 Disconnect the p6 ecu connector. Measure the resistance and voltage of the wire harness side connector. Reconnect the p6 ecu connector.